"In Madame de Chantal I have found the perfect woman, whom Solomon had difficulty finding in Jerusalem". - St. Francis de Sales, her spiritual director. St. Jane Frances de Chantal was born in Dijon, France, on January 28, 1572, and died at the Visitation Convent Moulins on December 13, 1641. Jane (Jeanne) was born into nobility, her father being the president of the parliament of Burgundy. At age 20 she was married to the Baron de Chantal. Jane had four children, and loved and served her young family deeply until the death of her husband in a hunting accident at age 28. For seven years she was forced to live in the house of her father in law, a trial which she was forced to bare patiently due to his ill-disposition towards her, and it was during this time that she took a vow of perpetual chastity. In all of her prayers, Jane asked God to send her a guide. In a vision, He showed her the spiritual director that He held in reserve for her. During Lent, in 1604, she visited her father at Dijon, where St. Francis de Sales was preaching at the Sainte Chapelle. She recognized in him the mysterious director who had been shown to her, and she placed herself under his guidance. Then began the famous correspondence between the two saints which produced volumes of letters of spiritual direction, some of which are available today, but most of which were destroyed by her upon the death of St. Francis. She went to Annecy in 1610, where she believed God was calling her to found an order for women and girls who felt called to live the life of Christian perfection, but not practice the severe asceticism of the religious orders of the time. Thus the Congregation of the Visitation was canonically established at Annecy on June 6th, 1610, Trinity Sunday. The method of spiritual perfection of the Visitation nuns was that of St. Francis, which consisted in always keeping one's will united to the Divine will, in taking -so to speak- one's soul, heart, and longings into one's hands and giving them into God's keeping, and in seeking always to do what is pleasing to Him. There were 86 convents of the Visitation nuns at the time of her death 31 years later. 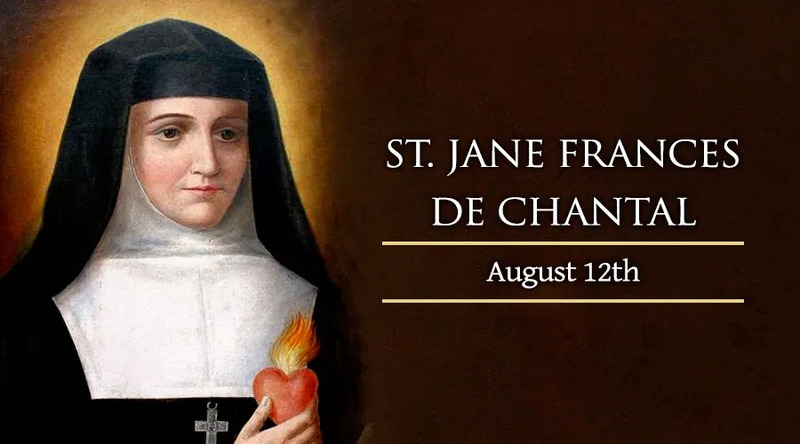 St. Jane Frances de Chantal's spirituality was a strong and resilient one; she did not like to see her daughters giving way to human weaknesses, and encouraged constant battle against the passions and habits which keep one from following God's will. Her trials were continuous and borne bravely, and yet she was exceedingly sensitive. She endured interior crosses which, particularly during the last nine years of her life, kept her in an agony of soul, from which she was not freed until three months before her death. Her reputation for sanctity was widespread. Queens, princes, and princesses flocked to the reception-room of the Visitation. Wherever she went to establish foundations, the people gave her ovations. "These people", she would say confused, "do not know me-they are mistaken". Her body is venerated with that of St. Francis de Sales in the church of the Visitation at Annecy. She was canonized in 1767.